I’m originally from Seattle, a mossy green, slate grey place I love. I miss the heavy-bellied clouds dragging across the sky, and it’s still difficult for me to reconcile myself with San Diego’s perpetual blue skies. I have, however, begun to attune my senses to the subtle seasons here, and I certainly can’t complain about the crazy-long growing season. 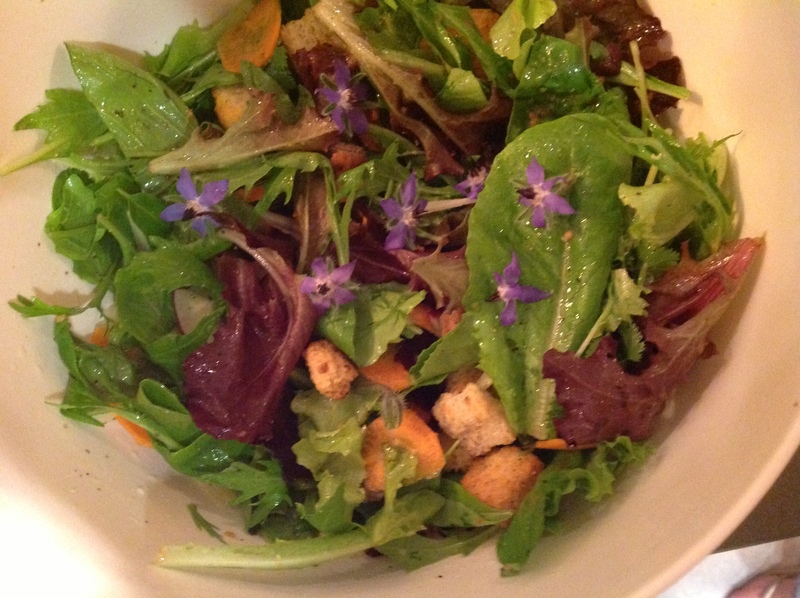 This is a salad made in early March with local, seasonal ingredients, including herbs from our own garden and mesclun, carrots, and radishes from our Be Wise Ranch CSA box. Listen: Because of the garden/ “grow your own” nature of this recipe, I recommend my favorite John Prine song, “Spanish Pipedream” which includes the lyrics, “Blow up your TV. Throw away your paper. Go into the country. Build you a home. 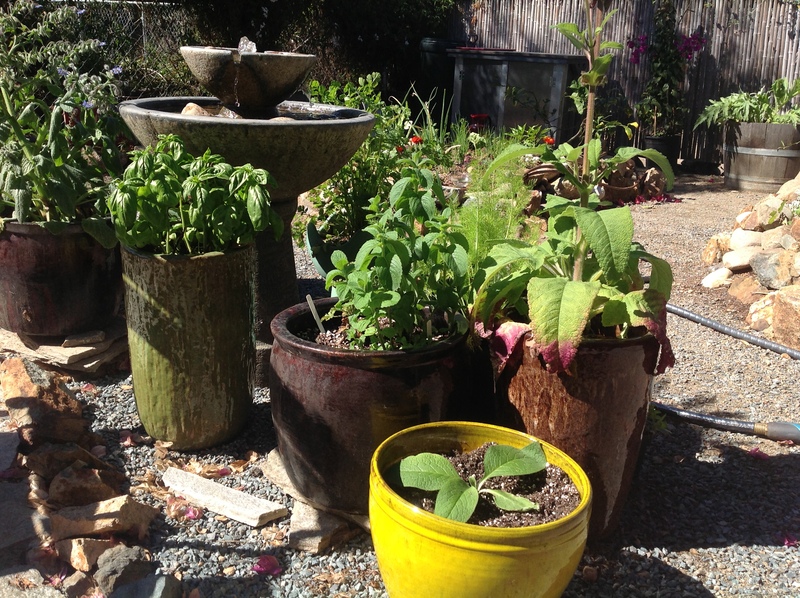 Plant a little garden…” Then, in honor of the teeming bird life in the happy garden, add “The Littlest Birds” by the Be Good Tanyas to your herb salad playlist. Wash and dry or spin enough mesclun for your eaters. Add fresh, chopped cilantro, basil, borage blossoms. 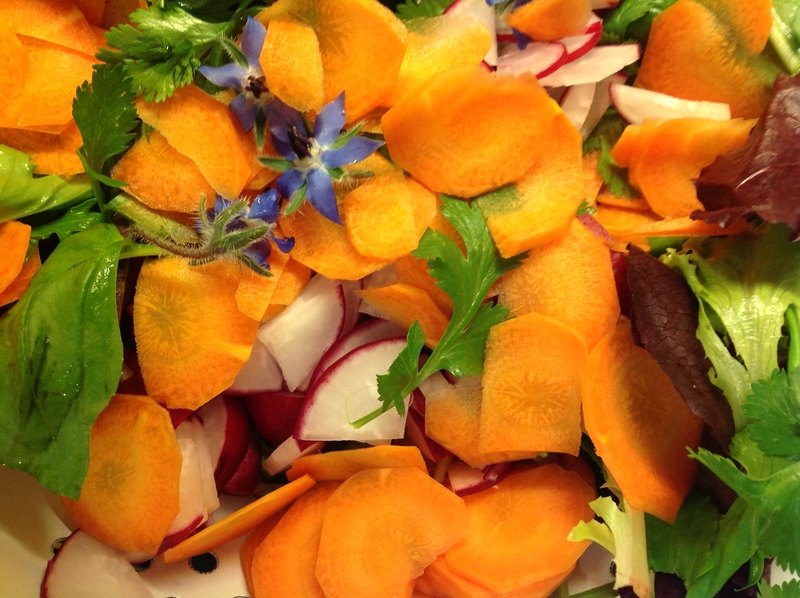 Slice fresh carrots and radishes thinly. I used a vegetable peeler for the carrots. You could also use a mandolin or a small, sharp knife. Slice some Manchego cheese thinly and then cut it into smaller pieces. Toss all of this gently with a splash of Sicilian Lemon Vinegar, olive oil, and salt and pepper to taste. This could easily be a romantic dinner for two or a beautiful and simple meal for a large group. Just adjust the amount and ingredients to your group and palate. We served the salad with a piece of grilled salmon from Catalina Offshore in San Diego–bon appetit! 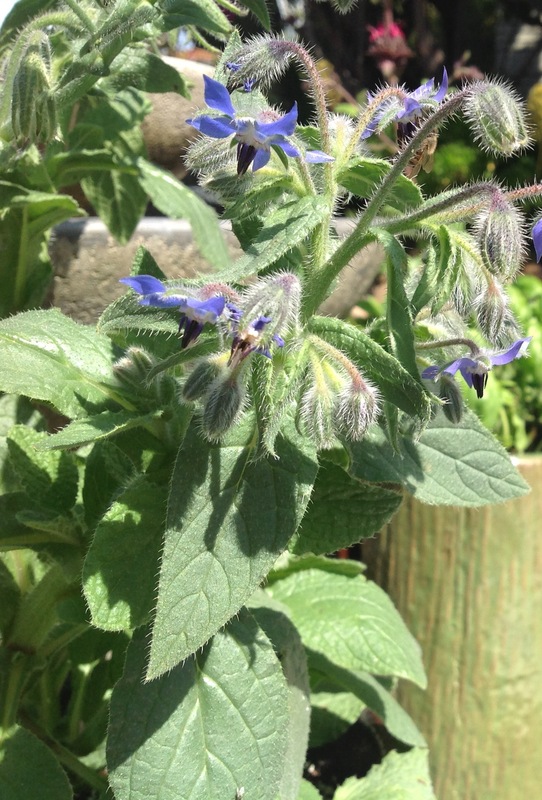 Borage blossoms are sweet, edible, periwinkle blue, and star-shaped…a beautiful accent on a salad, and very easy to grow. Look closely, and you’ll see how the bees love them too. The perpetual blue skies [i.e. single season] aspect of SD you referenced is tough to swallow for a native / current inhabitant of a four-season location, but you’ve made the swallowing a whole lot easier and far more tasteulicious with your recipes literary seasonings. But I’m curious….do you pronounce ‘herb’ with a silent ‘H’ or a moderately obvious ‘H’? I use the silent “h” for edibles and the noisy “h” for people, as in I went to elementary through high school with a really nice guy named Herb, and Doug had an uncle named Herm. Glad I would soften the seasonal subtlety for you with a little culinary fun…don’t forget the sipping and listening, Hankster!